"It is true that the celebrations must be beautiful - beautiful - but not worldly, because worldliness depends on the god of money. It is an idolatry like others. This makes us think about our attitude to the house of God, our respect for churches when we enter ". Vatican City (AsiaNews) - Pope Francis on Friday urged that churches be given due respect as the “house of God” and not be transformed into markets or social lounges stained dominated by “worldliness”. 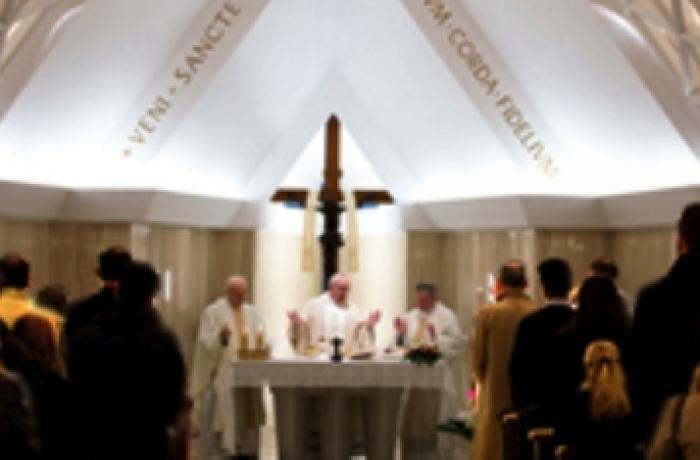 Celebrating his morning Mass at the Casa Santa Marta in the Vatican, inspired by the passage from the Gospel (Jn 2: 13-22), he warned that churches risked transforming themselves into marketplaces with sacraments on sale, which are free. 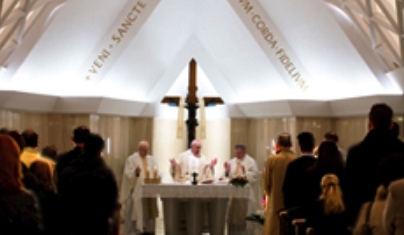 Celebrating his morning Mass at the Casa Santa Marta in the Vatican, he warned that churches risked transforming themselves into marketplaces with sacraments on sale, which are free. The Pope recalled instances where there is a price list of the sacraments that are free of cost. To those who argue that it is an offering, the Pope said, offerings are to be put secretly into the box without anyone noticing it. He warned that there is this danger even today. Pope Francis admitted the Church needs to be maintained by the faithful but, he said, this is done in the offering box, not with a price list. Another danger that the Pope warned against was the temptation of worldliness. He noted that during a few celebrations or commemorations in the Church one cannot make out if the house of God is a place of worship or a social parlour.